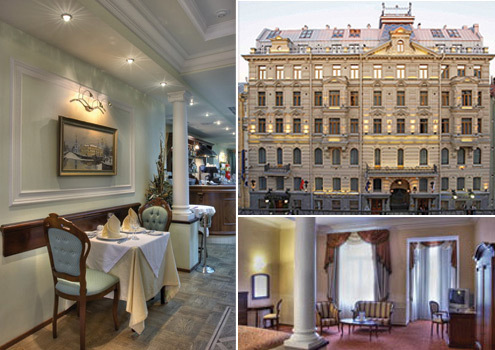 The Petro Palce, situated on Malaya Morskaya, was an amazing hotel, far exceeding our expectations. It was spotlessly clean, well appointed, roomy and furnished to a standard approaching sheer luxury. And every single member of staff went out of his or her way to make our stay perfect and – dare I say it – always with a huge, beaming smile. The hotel’s Baron Restaurant, too, was something else. We had heard that Moscow was the most expensive city in the world to live or stay in, so we figured St Petersburg wouldn’t be so far behind. We were absolutely right (a meal for two with a bottle of red coming in at around £90 to £100) but the menu, and the way it was cooked and presented, we absolutely exceptional. When I’m abroad, I very much like to partake of local food and drink, and the Baron serves up Russian cuisine at its very best; dinner rapidly became something we really looked forward too. Expensive it was, but then what’s Amex for? It was as we ascended to our seventh floor luxury apartment (I hesitate to call it just a room) that we discovered what turned out to be one of the real highlights of the Petro Palace: adjacent to the lift was the incredible Sky bar. This ultra trendy yet oh so relaxing bar was open each evening (until the wee small hours) and was literally a stunning window on the bustling world below, affording superb views of St Isaac’s Cathedral, The Hermitage and beyond. Small bar stools in the main window allowed us to relax over a Russian Standard and dreamily pass a very pleasant hour or two watching the world go by, while more comfortable sofas adorned the main floor area, and were perfect for intimate little gatherings. The Petro Palace, situated on Malaya Morskaya, was an amazing hotel, far exceeding our expectations. It was spotlessly clean, well appointed, roomy and furnished to a standard approaching sheer luxury. And every single member of staff went out of his or her way to make our stay perfect and – dare I say it – always with a huge, beaming smile. The hotel’s Baron Restaurant, too, was something else. We had heard that Moscow was the most expensive city in the world to live or stay in, so we figured St Petersburg wouldn’t be so far behind. We were absolutely right (a meal for two with a bottle of red coming in at around £90 to £100) but the menu, and the way it was cooked and presented, was absolutely exceptional. When I’m abroad, I very much like to partake of local food and drink, and the Baron serves up Russian cuisine at its very best; dinner rapidly became something we really looked forward too. Expensive it was, but then what’s Amex for?